Spotify’s share price closed on the New York Stock Exchange at an all-time high on Friday (June 8) – pushing the company’s market cap comfortably above $30bn. 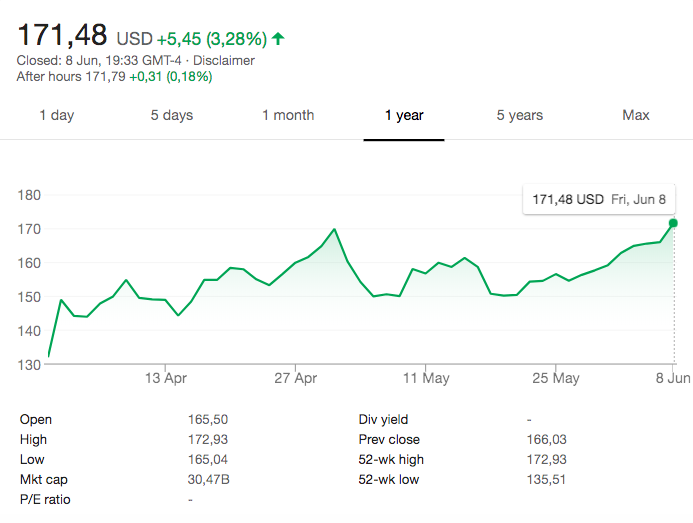 The below market summary, courtesy of Google Finance, shows how Spotify’s stock price consistently climbed in the eight trading days following Tuesday, May 29 – up to $171.48 at the close of last week. What could have nudged the share price higher over the past week in particular? Very possibly the news that Spotify is starting to strike direct, non-exclusive licensing deals with artists and managers. Wall Street has long speculated that Spotify may try to improve its gross margins by somehow ‘cutting out’ the record labels where possible, therefore reducing the overall percentage of revenues the platform pays out in licensing fees. Some analysts have suggested Spotify could do this by ‘signing’ acts – effectively acting like a label itself. Yet, for one thing, this idea often doesn’t take into account the power of Spotify’s key suppliers, and how they might react. According to a financial document filed earlier this year by Spotify, acts signed to the three major labels (and labels repped by independent agency Merlin) were responsible for 87% of Spotify streams in 2017. According to Billboard’s new report, Spotify’s current approach to direct licensing is a little more complicated/clever than a straight ‘signing’. The platform is reportedly paying managers and/or independent artists six-figure advances, and then additionally offering these acts a royalty rate equivalent to a 50% revenue share per stream. Although 50% is lower than the much-cited 55% revenue share the labels have typically received in recent years*, it’s inevitably a higher cut of the proceeds than that an act would pocket by signing to a record company… and then letting Universal, Sony, Warner or an indie label take a cut of the payout. In other words, it looks as though Spotify is trying to hit an economic sweet spot: it’s paying artists a higher net royalty rate than they could achieve via a label or distributor – but it’s a rate which, overall, leaves Spotify better off than its typical licensing deals with industry partners. Judging by Spotify’s latest stock price, Wall Street likes what it sees. One other oft-rumored approach Spotify could take to improving its gross margins is to start selling B2B data or analytical tools direct to labels, managers and publishers. That possibility is yet to materialize; such information currently remains freely available for industry partners.